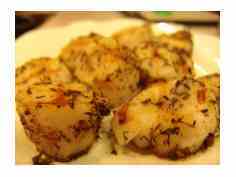 Grilling scallops isn't tough at all, but there are some tips to follow that I will cover with you here. You definitely want to watch the video at the bottom of the page as well. They are considered one of the best sources for protein, and if prepared properly they have a very unique, sweet flavor. The recipe for this video is "Grilled Mediterranean Scallops On a Bed of Smoked Gouda Cheesy Grits," but most of the time is spent talking about grilling scallops. 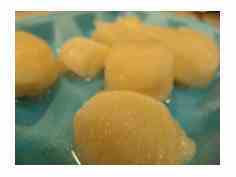 This is a very easy recipe, and the directions (including a video) for preparing the "Smoked Gouda Grits" is located in the "Sides" section of this website. It is a very good thing to invest in a spice grinder. We use ours all the time when making rubs. Also, slightly crush the thyme and oregano in the palm of your hand to release the aroma and flavor. The fennel seed aroma and flavor is released when it is ground. Pick Good Scallops: There is nothing worse than seafood that is not fresh. Scallops should have very little (if any) fish smell. 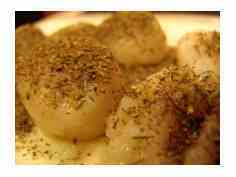 In fact, you will notice a sweetness if they are good scallops. Proper Grill Perpetration: This is key. you will want to get the grill as hot as you can, clean the grate with a wire brush, and then apply olive oil to the grate with paper towel. Stay With It: Don't leave the grill for a moment, as scallops cook very quickly. The video does a good job of explaining this. 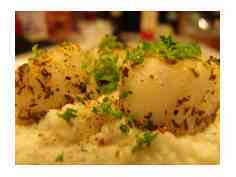 Eat Rather Quickly: Because of the size of the scallops, they tend to cool quickly. 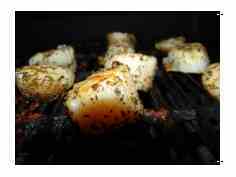 Leave Grilling Scallops and Return to BBQMyWay Homrepage.